A point of technicality: the FBI almost certainly has the ability to modify the iPhone software to circumvent the self-destruct feature. In fact, doing that is within the reach of anybody who has the contacts, money, and time to hire one or two decent reverse engineers. The problem is, the FBI doesn’t have the ability to load the modified software onto Farook’s iPhone, as doing this would require the modified software to be signed with Apple’s cryptographic keys, so that the iPhone doesn’t reject the “update” as some random malicious hacker. Even if they don’t have a way to circumvent the self-destruct feature specifically, if they have a phone and they can’t break it as a nation-state attacker, they’re incompetent. They almost certainly have a huge collection of known bugs and exploits that work on all kinds of different phones. But that’s also going to be a major expense of time and manpower to keep up to date. The government is feeling the strain of attempting to keep up, and wants to make it so that they have easy access to phones. This isn’t about the ability to break phones in extreme cases, or public access to military-grade encryption – it’s about establishing precedent for the FBI to make it way easier for them to do it whenever they want. A note: Public access to good (“military-grade”) crypto is both impossible to control at this point and kind of not the point – even if the crypto is good, a lot of security protocols that implement them are flawed. In most cases, you’re never attacking by breaking crypto, you attack by finding flaws in the system it’s embedded in or places in the system where crypto keys are leaked. To the point where “the crypto can’t be broken” is an extremely common assumption in security design. There’s still more to the story, one that tilts it more back to the government’s position. Software on the iPhone is protected from hacking by an encryption key that Apple presumably has heavily protected, with the upshot that only Apple can change the software. Apple could in fact modify the software on Farook’s phone in a way that would work *only* on Farook’s phone, and that would disable the “ten tries then erasure” feature of that phone. No backdoor there, except for that single phone. And it looks like they could have done that quietly in response to the court order, and nobody would have known the difference. Unless, I guess, there really was a smoking bomb of information on the phone. So it really is more a political issue than a technological or precedent-building thing. Or maybe Apple is just tired of responding to government responses. Please link to a source for this “fact”. This would help somewhat in rebutting the argument that, once they write the software, assuming that they can, that the government will be able to use it as a “back-door” or “master key” in any future case they care to. They would, instead, have to get a court order in each case and pay Apple’s “expenses” in providing the service. This could provide Apple with a potentially lucrative new revenue stream, if they were to follow the example of defense contractors. That level of service would surely be more expensive than a toilet seat or a hammer! I thought I heard that the phone is a county-owned phone. Apple sold the company a phone that had the encryption key, then allowed the employee to use it without requiring the employee to have a key that was company-sponsored? Apple sold a product with that feature, and the county purchased it, agreeing to the product feature. So the county (a government agency!) agreed to the contract. I’d say that the county failed to behave responsibly. We are already living in a police state so does all of this really matter? America has a long way to go before it becomes North Korea or even China, and cases like this are part of the effort to keep it from going that way. I’m not familiar with Rushkoff, but I think that interview with him illustrates one of the particular difficulties about this case—that a lot of people’s intuitions (and a lot of our laws, for that matter) aren’t really caught up with the technology we’re all using on a daily basis. So Rushkoff feels like individuals shouldn’t need “military-grade” crypto like banks do, just as our bank vaults need stronger locks than our houses. But this intuition makes no sense with the way the technology actually works—you can only do online banking, or online shopping, or anything with the little lock icon in your browser, safely if both your computer and the bank’s servers know how to do the same encryption. And Rushkoff feels like a powerful federal agency ought to be able to break into the phone on their own, or they’re incompetent—but in reality, unless or until the government develops quantum computers and keeps them a secret, there’s nothing special about their computers that should make them able to break in. If the FBI could break the encryption by throwing lots of computing power at it, then so could anybody in the world with a credit card and an AWS account. Rushkoff is a medium-popularity author, specializing on speculating about the effects of technological change on society. A nation-state level attacker is actually almost certainly going to be able to break a phone – not because they have quantum computers they’re keeping secret, but because they have known exploits they’re keeping secret. Breaking crypto is hard, but crypto is embodied in various primitives that are then put into security systems – and unlike the crypto, we usually don’t have mathematical guarantees that these security systems are solid. Nation-states can leverage a lot of resources and manpower towards discovering exploits through research or paying attention to what black-hats are doing that they can then try to use on their enemies. One more thing to consider, the FBI is asking Apple to create new software. This might or might not be physically possible. What precedent does it set if it isn’t actually possible for them to create the software. Does that make them in contempt? What about the next time the government wants something, can they use this new law to force a tech company (or any other company) to create something that they want? Even if it isn’t possible? And even if it’s possible, who pays for it? But no one has said that the keys to the next attack are to be found on this specific phone. As Bergen points out, the FBI already has most of the available info anyway from email, FB, phone records, previous iCloud backups, etc. My guess is that both sides like the optics of the current conflict. The FBI is getting tough on terrorism and Apple is defending their customers’ privacy. Win/win. I’m someone with no loyalty to Apple at all. I’ve never owned an Apple product, and if I have my way, I never will. With that said: I side with Apple on this one, simply because any precedent set against Apple in this case would be used to “convince” other tech companies into doing the same thing that the FBI wants Apple to do in this case. The usual arguments for letting the government do extreme things is usually the “ticking time bomb” scenario. That is, the government must have the information it wants, or people will surely die. That just isn’t the case here. The crime has already been committed, and the shooters are dead. There’s no ticking bomb. Likewise, for all that terrorist attacks are scary, they’re also highly improbable. so if the FBI is protecting us this way, it really isn’t protecting us from very much. 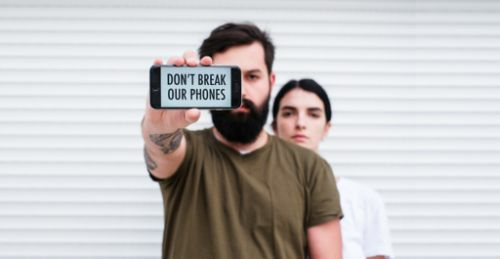 On the other hand, if Apple builds a “back door” into it’s phones, it is certain that hackers including the Chinese government, the Iranian government, and various criminals, will manage to get into Apple’s phones. I think it’s pretty easy to make a case based on probability. Like this: What is the probability of being killed in a terrorist attack? Answer: nearly zero. What is the probability of the Chinese government getting into an Apple phone, if Apple builds in a back door? Answer: nearly 100%. So making Apple build in a back door would give many criminals and unfriendly governments the ability to get into your phone, and it wouldn’t make you any safer from terrorists. I should also add that we’ve had another shooting since the one in San Bernadino. But it was done by a by white guy, so it isn’t considered a terrorist threat, even though the victims are just as dead. Is the FBI demanding a way into the Michigan shooter’s phone? Just asking.